Donate $10 (let’s put that in context: the cost of two Starbucks cappuccinos… except tax-deductible) and select which prize you want from the dozens put up by participating travel bloggers worldwide (including yours truly!). You’ll be entered into a sweepstakes for that prize. (So if you want mine, make sure you select it!). Donations for multiple prizes are fine, too! All of the money donated goes to this year’s Passports with Purpose charity, Water.org, which will fund five wells for clean water in rural Haiti (cost: $100,000). Already convinced? Donate (or just see the great prizes from all the travel bloggers) now! (And don’t delay: The sweepstakes ends on December 11th!). And on December 18, a winner will be randomly selected and notified for each prize. 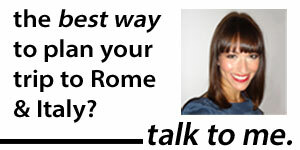 Want to know what I’m offering as the Revealed Rome package prize? Read on! 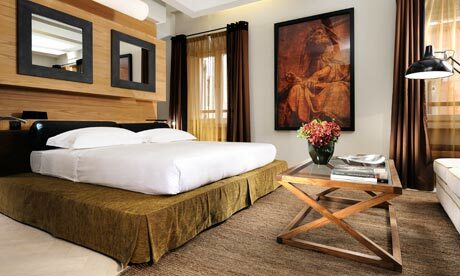 Want to stay at a hotel like this one in Rome? Then enter to win! All three of Rome Luxury Suites’ properties—Babuino 181, Margutta 54, and Mario de’ Fiori 37—are luxurious, intimate, and in the Spanish Steps neighborhood, right in the heart of Rome. I’ve looked at all three multiple times for work, and I can promise, they’re all seriously gorgeous (which is why I’ve recommended them in the Guardian, National Geographic Traveller, and on my blog!). Oh, and prices start at about €200 a night… in low season. Even though these hotels get booked up way in advance, Rome Luxury Suites has very kindly, and generously, offered to put the Revealed Rome prize winner up for two nights at one of their properties. The stay includes breakfast and access to all of the properties’ usual amenities, including free Wi-Fi, the daytime concierge service, and more. Just remember that these are very intimate hotels (Babuino 181, the largest, has just 24 rooms), so the winner will need to book as far in advance as possible, as this prize is contingent on availability; blackout dates are Dec. 26-Jan. 1, and the expiration date is Dec. 31, 2013. (I’m convinced! Let me donate now for a chance to win!). 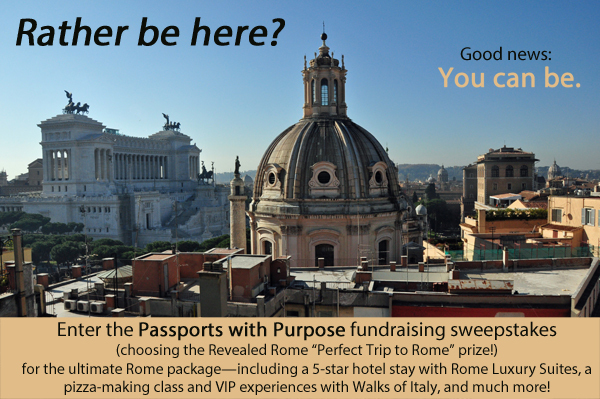 Win the chance to experience Rome’s food like a local with Walks of Italy! I heart Walks of Italy, and one of their newest experiences—a Rome food tour, complete with tons of tastings and a pizza-making class—might be their best yet! 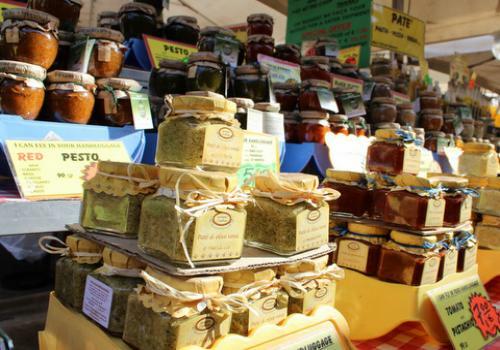 It includes an exploration of Rome’s most bustling food market, Campo dei Fiori, with tastings of olive oil, balsamic vinegar, breads, meats, cheeses, and more; a pizza-making class (and, of course, enjoying the pizza you made) at a Roman pizzeria; and a stop for gelato or cannoli and a coffee. Seriously, after this tour, you won’t want to eat for weeks. Except that you will, because you will have discovered just how delicious authentic Roman food can be. Up to four guests get free spots on the small-group (maximum 12 person) tour. There are no blackout dates, but the spots are available only on the days the tour runs—which currently are Tuesday, Thursday, and Saturday. If the winner isn’t able to visit Italy personally, Walks of Italy has been kind enough to allow the prize to be transferrable to the winner’s friends or family. Prize value: Up to $305. (Okay, okay, I got it! Let me donate now for a chance to win!). If getting to eat your own weight in pizza and pastry weren’t enough, Walks of Italy is also kind enough to offer up one of their most-subscribed tours: the Sistine Chapel Spotlight—Vatican Museums Highlights experience. 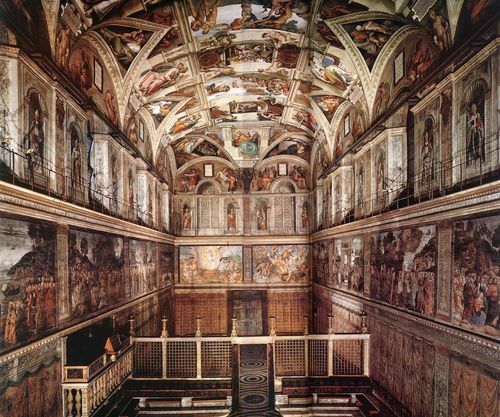 Skip the line into the Vatican and discover the museums’ treasures, including the Sistine Chapel and its famous frescoes, with a small group (maximum 12 people) and a top-notch, enthusiastic Vatican expert. All ticket fees are included. Again, up to four guests get free spots on the small-group (maximum 12 person) tour. There are no blackout dates, but the spots are available only on the days the tour runs—which currently are Monday, Wednesday, and Saturday. If the winner isn’t able to visit Italy personally, Walks of Italy has been kind enough to allow the prize to be transferrable to the winner’s friends or family. Prize value: Up to $280. (Yeah, this really does sound amazing! Let me donate now!). 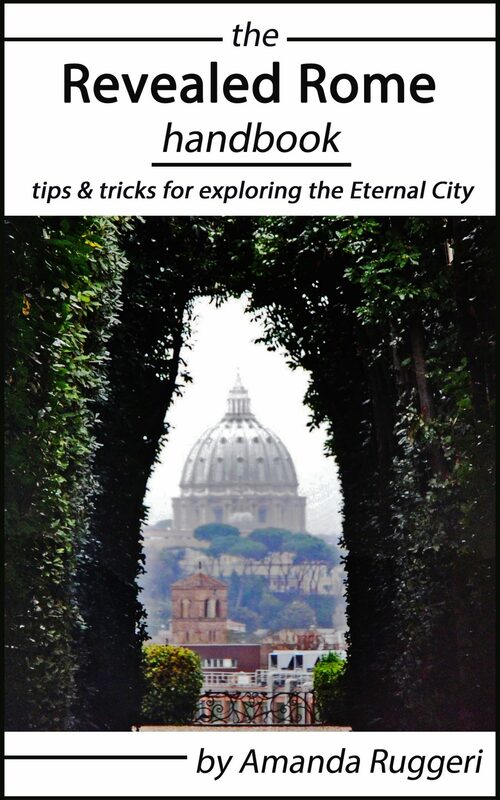 Revealed Rome’s personalized expertise… including my handbook, a one-hour consulting session, and a meet-up in Rome! On top of that fabulous hotel stay and those fantastic experiences, I’m offering you the tools you need to make your Rome trip the best possible. 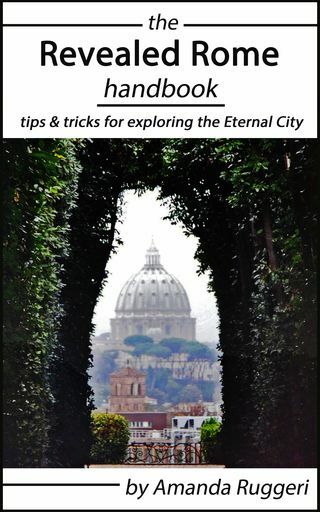 As part of the Revealed Rome prize package, I’ll give away a copy of my brand-new e-book, The Revealed Rome Handbook: Tips and Tricks for Exploring the Eternal City , which is chock-full of tips and tricks like how to navigate Rome’s public transport system, the best neighborhoods in Rome for shopping, and how to pick an authentic Roman restaurant by sight. I’m also offering a 60-minute, one-on-one Italy travel chat (by Skype or Google Hangout), with a follow-up email, to help you with your trip planning. I’ve traveled a ton around Italy, so this isn’t just useful for Rome—feel free to pick my brain on Florence, Venice, Pompeii, the Amalfi coast, or anywhere else! Finally, I’ll provide the winner with a personal welcome to Rome! We’ll meet for a quick coffee or glass of wine at one of my favorite spots in the city, and I’ll help them get oriented and answer any extra questions they might have. (This depends, of course, on availability and whether I am in Rome at the time the winners arrive). (Okay! I really want a chance to win! Let me donate now!). Finally, Walks of Italy has offered a discount of 20% off on any of their services, including experiences in not only Rome but Florence, Venice, and beyond, as well as transfers, to the lucky winner. And whether or not you win… you’ve helped hundreds of people without access to clean water get two wells in their area. Talk about a feel-good donation. So… what are you waiting for? Donate now! Remember, your chance to win ends on December 11th!